Say her name three times and she’s already run a mile. Sophomore Katie Guarnaccia has dominated the Kentucky Intercollegiate Athletic Conference (KIAC) this year and is solidifying herself as one of the top female cross country runners in the National Association of Intercollegiate Athletics (NAIA). She received KIAC Runner of the Week honors in each of the first four weeks of competition and placed in the top five of every meet this year. Last year, Guarnaccia quickly made herself stand out at Point Park, winning KIAC Runner of the Week honors in two of her first meets. Guarnaccia is not only winning, she’s winning big. She is repeatedly setting new personal-record times. Her times are not only personal records, but also school records. At the Duquesne Duals, Point Park’s first meet of the year, Guarnaccia broke the Point Park women’s 5K record that she and teammate Kelsey Wilkins set last year at the KIAC Championship Meet. She topped her former record of 19:24 by 35 seconds with a time of 18:49. In the second meet of the year at the Bethany College (W.Va.) Invitational, she was the individual champion and set the school 6K record with a time of 22:56. The next week at the Penn State-Behrend Invitational, she came away with her second straight individual victory en route to breaking her own record with a 5K time of 18:46. This past weekend at Lock Haven, the sophomore broke her own 6K record with a time of 21:42, improving her PR by 1:14. Junior Emily Maxwell also bested the previous 6K school record with her time of 22:53. The North Allegheny High School graduate is well on her way to a second straight NAIA National Championship meet appearance. Last year at the national meet, she placed as the top KIAC runner with a 5K time of 19:30. The then-freshman placed 115th of 336 runners in the meet. Guarnaccia is not the only runner experiencing success this year. Freshman Brian Moore keeps leading the way for the men’s team. He has received KIAC Runner of the Week honors in three of Point Park’s first four weeks of competition, including this past weekend at Lock Haven. The men took first place of 17 teams at the Bethany meet two weeks ago and also has multiple runners set PR’s in this past weekend’s Lock Haven meet. In fact, all but one runner on the men’s side registered a personal-record 8K time at the at NCAA Division II meet that saw six Point Park runners under 28 minutes. The cross country teams are cruising. They have the depth to give them success at the KIAC Championship Meet Nov. 7 at Rio Grande and the youth to keep them as a top school in the conference for years to come. 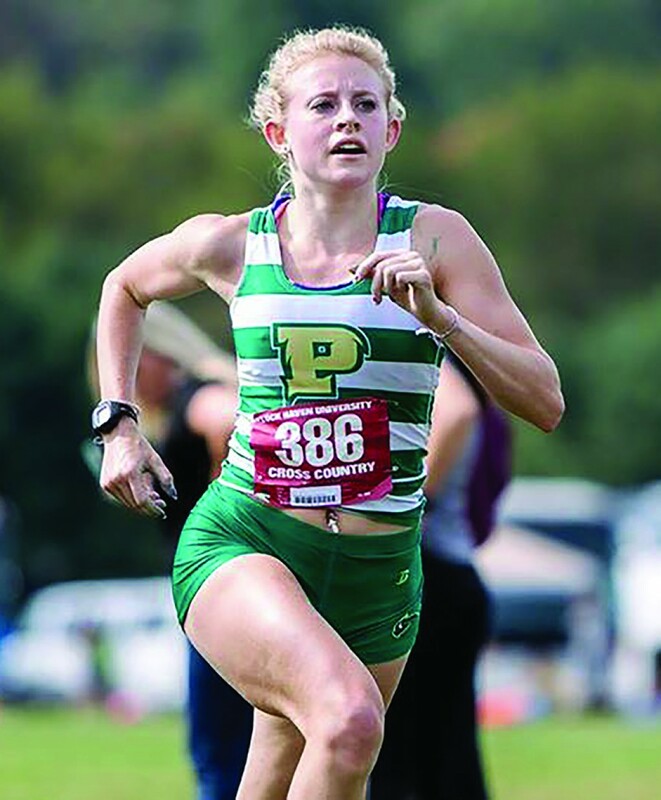 Point Park Cross Country is exactly halfway through their regular season. After competing this weekend in the Louisville Classic, they return home for the Carnegie Mellon Invitational Saturday, Oct. 10 during Point Park’s Family Weekend. photo courtesy of Point Park Athletics Sophomore Katie Guarnaccia’s fifth-place finish at the Duquesne Duals set a 5K school-record time of 18:49 in the season’s first meet.